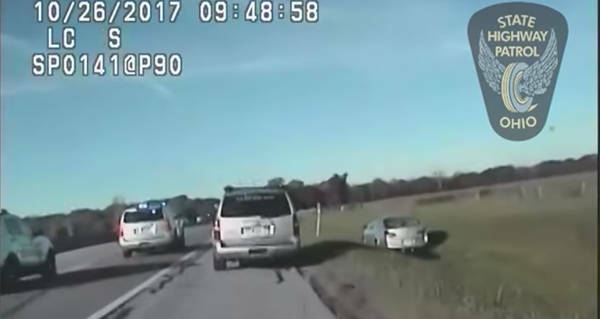 A 10-year-old boy from Cleveland led police on an hour-long high-speed chase on Thursday morning, after stealing the keys to his mother’s boyfriend’s car. According to the Ohio State Highway Patrol troopers, they were tipped off by the boy’s mother, who noticed that her son had stolen the keys. “My 10-year-old stole his dad’s car, and he’s running from me,” the mother said in a call to a 911 dispatcher. She told police she jumped in her own car and attempted to chase him as he got onto the Cleveland highway. The boy made his way down the highway, weaving in and out of cars, at times reaching speeds of 100 mph. At one point a dozen police cars and state trooper cruisers were following behind him. Eventually, the boy swerved off the highway onto the grassy shoulder. The police thought the off-roading would slow him down, but he continued driving on the grass parallel to the road. Dash cam footage in one of the cruisers caught the trooper’s exchange as they attempted to stop the boy. “Can you advise on intentional contact to stop him?” another trooper asked. “One car as gently as possible,” one answered. One of the patrol cars then nudged the boy’s car sideways and brought it to a stop. The chase had gone on for an hour and had covered 45 miles of highway. After stopping the car, the troopers swarmed the vehicle and dragged the 10-year-old out through a window. They then took him into custody, though no charges have been filed. According to authorities, this is the second time in two weeks that the boy had attempted to joyride in the same car. The first time, however, he found himself stranded with three flat tires. An eyewitness to the Thursday’s chase told the local news she was shocked at how such a thing could have happened. Though she had to admit, he was pretty skilled. “He was a good driver for being 10 years old,” she added. Next, check out the guy who tried to run from police, and failed miserably. Then, read about the police that saved a kidnapped Isreali teen.